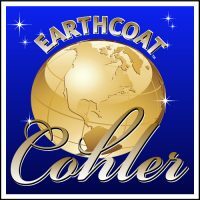 Cohler EarthCoat - Cyanide Free Plating - Krohn Industries, Inc.
Gold Bath Plating Solutions and Cyanide Free Gold Pen Pals® are a cyanide free alternative to traditional cyanide based gold plating solutions. 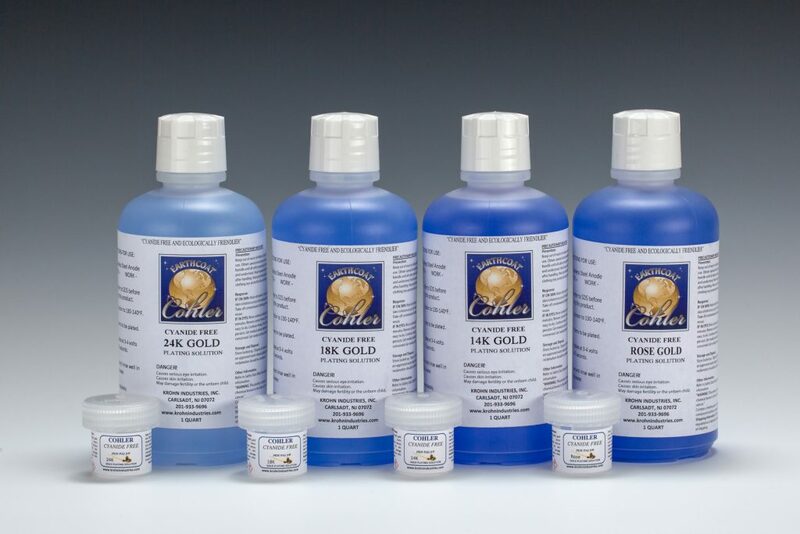 These bath and pen plating solutions produce durable, wear resistant gold deposits with 100% cyanide free formulations in 24K, 18K, 14K and Rose gold colors. PALLABRITE™ MIRROR is a maintenance free ready to use palladium plating bath designed as intermediate flash plate over gold, silver, and brass, or as a final plate over lower end jewelry. No ammonia pH adjustments are needed. This product produces a consistent bright white tarnish resistant barrier layer prior to gold or rhodium plating. 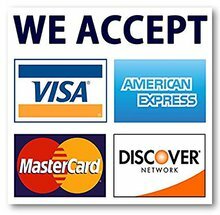 An excellent replacement for nickel pre-plates. Solution contains 2.5 grams of Palladium per quart. Silver-Free™ is a Ready to Use cyanide free solution that deposits a decorative silver flash plate over nickel, sterling silver, gold, rhodium, and many other similar metals. Copper Mirror™ produces a consistent, uniform, bright and shiny copper layer over dull surfaces in just 2-10 minutes. Air agitation is needed. Copper Primer™ plates a consistent uniform copper deposit. It can be used as a pre-plate over difficult-to-plate metals as well as a bonding metal between dissimilar metals. Nickel Mirror™ plates a consistent, uniform nickel deposit that is easy to operate and maintain. It deposits brilliantly bright and shiny Nickel over dull surfaces within 10-15 minutes, over Copper Mirror™ in just 3 minutes. 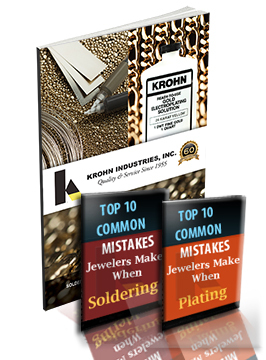 As a pre-plate, it enhances and brightens your rhodium, gold, and silver platted pieces. Black-Free™ is a black antique plating solution which plates a rich black coating that can be removed with minor abrasion. After the article is plated, the high spots are relieved to give the final antique look. Black-Free™ is a great alternative to flammable and toxic black lacquer dipping baths. Activator-T™ in solution produces a mild acid with super etching, brightening, and cleaning properties. Activator-T™ chemically cleans and activates your parts to assure a strong metallic bond during the cyanide-free plating process. 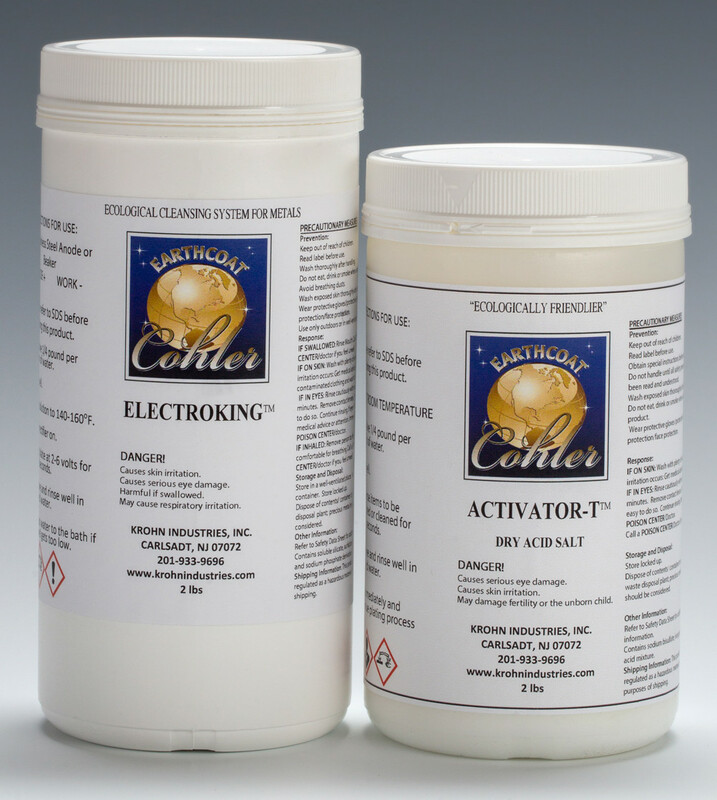 ElectroKing™ is an excellent electrocleaner specifically designed for the plating process.